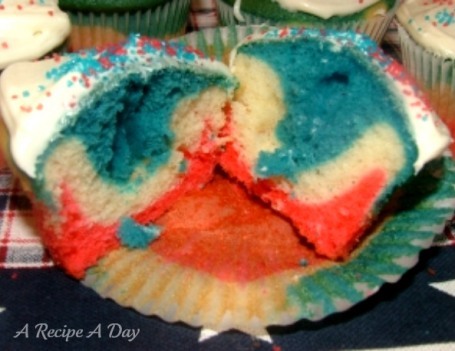 Since Wednesday is Independence Day, I thought I would reblog these cupcakes. They really turn out cute and are not hard to make. The only thing you have to be careful of the amount of each color of batter you put in each cupcake paper. For me, 2 scant tablespoons of each color batter worked but it might be different for you. Try layering the batter for one and see how it goes. Don’t fill them to the top, about 2/3rds full should do it! Bake at 350º for 20-24 minutes or until a toothpick inserted in a cupcake comes out clean. I figured someone would have a red-white-and-blue cupcake for the 4th 🙂 I was thinking the same thing, only blue berries and raspberries for the colors! That’s a great idea!! I think it would taste delish too. You can do it ~ it is really easy! !